Off the battlefield, the Harlem Hellfighters entertained their European fellow-soldiers with jazz and American ragtime music. The 369th Infantry Jazz Band, also known as the Hellfighters, was led by James Reese Europe. At the end of the Great War, the Hellfighters jazz band would perform for more than one million people as they marched up Fifth Avenue in New York City during the victory parade. Following the war, people welcomed these brave soldiers home. Soldiers of the 369th (15th N.Y.) who won the Croix de Guerre for gallantry in action, 1919. Left to right. Front row: Pvt. Ed Williams, Herbert Taylor, Pvt. Leon Fraitor, Pvt. Ralph Hawkins. Back Row: Sgt. H. D. Prinas, Sgt. Dan Storms, Pvt. Joe Williams, Pvt. Alfred Hanley, and Cpl. T. W. Taylor. Despite this, not much had changed in the day-to-day lives of these war heroes. The terrible ‘Red Summer’ of 1919 saw the eruption of anti-black riots in twenty-six different cities. The lynching of African-Americans was on the rise. At least ten of the seventy-seven lynching victims were war veterans and some were even lynched while in uniform. It would take another war, as well as decades of civil rights movements before equality was achieved. The U.S. military remained segregated until 1948, and it wasn’t until very recently that some of the inequality was addressed and partially remedied. In 2014, legislation was passed in Congress to pave the way for Sgt. Henry Johnson, who served in the 369th regiment, to receive the Medal of Honor for his actions during World War I. 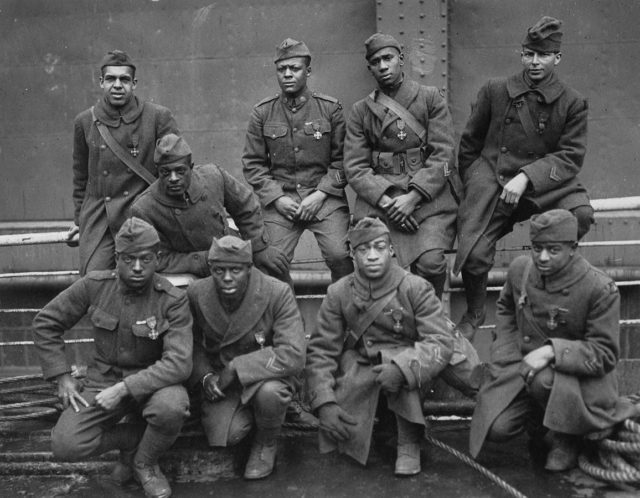 Due to racism in the Armed Services, many African-Americans were not awarded the honor for their services in the Great War. As for those soldiers who fell in battle, a total of 169 came from the 369th Infantry Regiment, they are buried at ABMC cemeteries. A majority are at Meuse-Argonne, but some soldiers were laid to rest at Aisne-Marne, Oise-Aisne, St. Mihiel, and Suresnes. All AMBC sites are integrated—race and rank had no influence on a dead soldier’s final resting place.